#FRIChallenge is also known as Fit Right In Challenge, a challenge that was issued to me by Physical ABuse, a local boutique gym just between Clarke Quay The Central and the headquarters for Ministry of Manpower. I had been wanting to shape up for the longest ever time, and every time I got down to the pool or gym, it will never last. It’s like working out for a day and resting for 3-4 weeks. How can I keep fit with such bad willpower? So the challenge came at a right time and it actually acts as a kind of motivation for me to persevere and continue, as it’s embarrassing to back out now that it’s has been announced to the public! Ok, I know I don’t exactly look fat, but I could feel my bottom getting heavier, it was harder for me to get into outfits I used to be able to (like shorts and fitting pants). On camera, my face look so much rounder too! Seriously, everything looks bigger and wider on camera, so even though my weight has gone from slightly underweight to acceptable weight, my fat percentage has went up by A LOT! I believe many ladies out there might have the same “heavy-bottom” problem as me, and might have been trying to solve it by cutting down on your meals, go on diet etc. But according to what I know, what we need to do is actually to target our problem area and turn those fats into muscles instead! 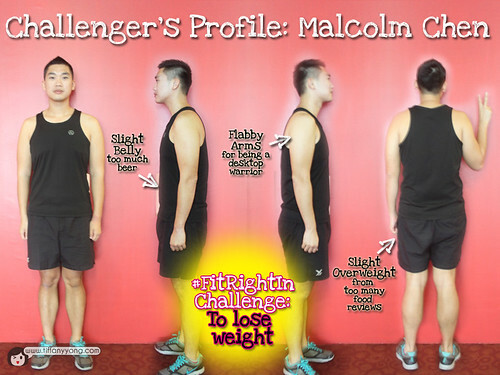 So this is my competitor, Malcolm. We are both aiming for different end-results, he’s trying to lose his weight as well as gain some muscles, while I don’t want to be bulky! I guess if we are to compete on who will LOSE the most amount of fats or weight, I won’t be surprised if he wins me (after all, he has more to lose than me! :P) But I am confident that I can lose what I aimed to lose! 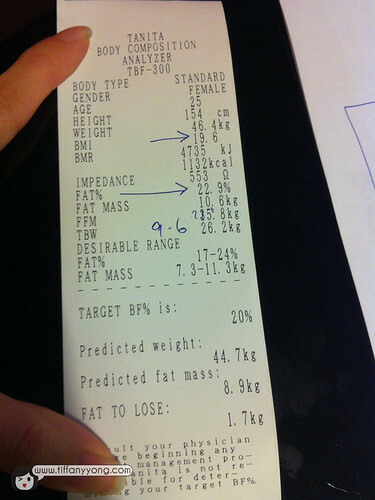 My fat mass (10.6kg) is on the higher end of the acceptable range (7.3-11.3kg) , and I am aiming to lower my fat mass to 7.3kg even though the amount of fats (predicted fat mass) I am supposed to have is 8.9kg. This shouldn’t be much of a problem and I am already looking forward to my lessons! 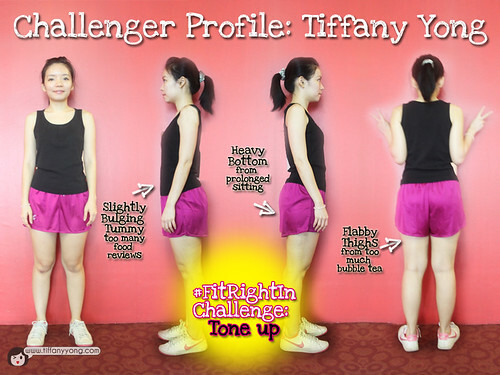 Do check out my twitter @tiffanyyongwt or #FRIChallenge for real time updates about the challenge k? I’m doing it, so join me! It’s never easy working out yourself, so do join me in this FRI Boot Camp. Physical ABuse had told me it is a fat loss guaranteed (of course, you have to follow their instructions) or it is money back! P.S. If you need some company to work out with you, just leave me a comment or message here! 🙂 Will definitely do so if time permits!